The Palestinian Health Ministry has confirmed that a child died, on Thursday afternoon, from serious wounds he suffered at dawn, after Israeli soldiers fired several shells at Palestinians, east of Rafah, in the southern part of the Gaza Strip. 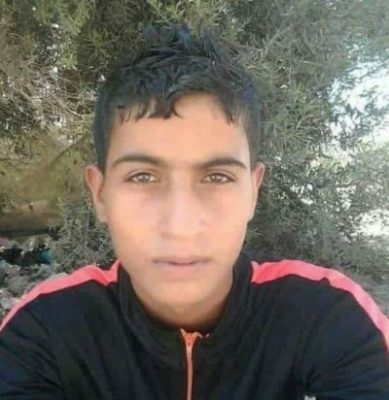 Dr. Ashraf al-Qedra, the spokesperson of the Health Ministry said the slain child, identified as Abdul-Fattah Mustafa Abu ‘Azzoum , 17, suffered serious head wounds, inflicted by fragments of an Israel shell. He was rushed to Abu Yousef Najjar Hospital, in Rafah, where he underwent an urgent surgery, but later succumbed to his wounds at the Intensive Care Unit. Another Palestinian was also injured in the Israeli attack and suffered moderate-to-severe wounds to various parts of his body. The Israeli army claimed that the two Palestinians “were crawling towards the border fence,” when the soldiers fired a shell at them.